Unlock Your Full Potential for Pleasure, Power & Fulfillment. This course is my invitation for you to re-wild yourself. Join our International tribe of women to engage with the innate wisdom of your body. To peel back layers of coping and contractions, closure and old habit. To release heartache, grief and trauma. To come back to yourself, the wild, glorious, untamed part of who you are, that holds power and wisdom. To claim the pleasure that is your birthright. But what if there were a way to experience the simplest pleasures of our lives on a deeper level, freeing the body and mind from these damaging patterns? Beyond our current stereotypes about femininity lies the ancient wisdom of the Wild Woman archetype, a model of building a feminine bodily intelligence. This course is a 6-Part Journey to connect with your innate feminine wisdom—with your living, feeling body as a portal to unlocking who you truly are. 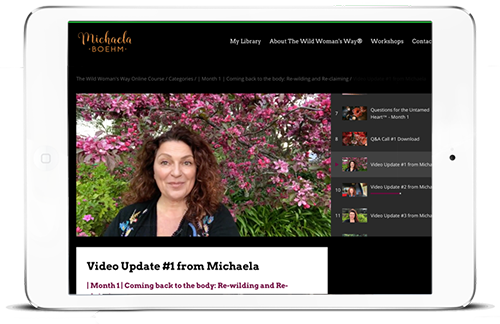 In The Wild Woman’s Way Course, Michaela shares practical rituals and exercises drawn from over 20 years of experience as an international teacher, celebrity counselor and expert in the field of relationship & sexuality. Each month focuses on one aspect of the Wild Woman. We will immerse into specifically themed embodied movement, sacred ritual and self-inquiry, integrating body, heart and mind to foster personal empowerment, deeper connection and understanding of who you are as a woman. Through these practices you will gain the ability to cognitively translate this bodily learning into engagement with a partner, your career and your chosen tribe. 1. Wild Woman’s Wisdom Lecture: A pre-recorded lecture video in which I introduce the theme of the month, give background, education and inspiration as well as explain the wider applications of the practices for your everyday life. 2. A Guided Feminine Embodiment Exercise: A monthly recording of guided embodiment instructions as a means of awakening your body’s innate intelligence and resilience. 3. Sacred Ritual Instruction: An embodied ritual to accompany and deepen each months theme. 4. Questions for The Untamed Heart™: A self-inquiry questionnaire to connect heart, mind and body. 5. Q&A Recordings with Michaela: Listen in as Michaela answers questions and gives practical tools that support the course practices and integrate your learning. 6. Community & Connection: Connect with women from around the globe through a private Facebook group. Receive additional material via group posts, exchange experiences and share practice music as you join the Wild Woman’s Tribe. 7. Live Event Discount: Receive special discounts for live events that we host for an entire year. 8. Lifetime Access: Lifetime Access to all of your lectures, call recordings, embodiment instructions and rituals, and the private Facebook group. 9. And Bonus Items each Month! Soon, you will learn to switch effortlessly between the aggressive “go-mode” required to compete successfully at work, and the feminine “flow-mode” of softness and receptivity. 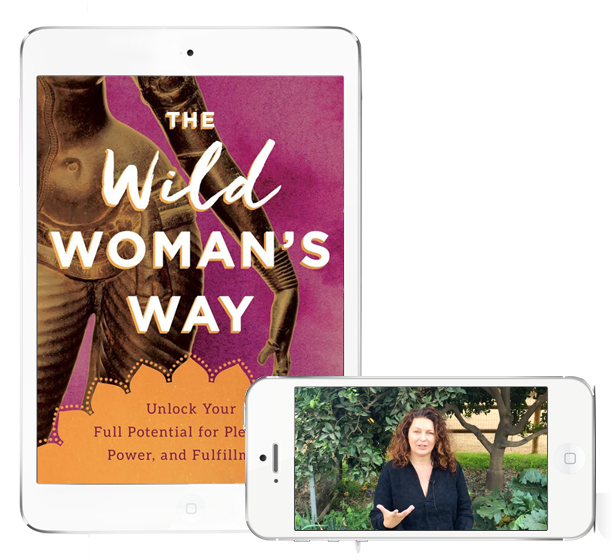 By harnessing the innate wisdom of the Wild Woman, you will deepen and inspire meaningful relationships with your own body, romantic partners, and with life itself. I would pay $5000 for this course! This course has consistently delivered at this level in it’s content, practices, live calls & private group. Michaela is superbly organized, meticulous, holds a strong container and is a leader in her field—so I was able to accelerate my own learning and understanding of the curriculum! This course has helped me with tools to release and relax my body and express myself with no filters. I have become more sensitive of my body’s clues and guidance in daily life. The shift is subtle but the impact is huge. I also love the infusion of sacred into mundane via many rituals we have learned. I would highly recommend this course. I’ve discovered ways to delight in being the current version of myself while also being inspired to become more of the authentic woman that beckons me forth—the one that meets life with a smile of satisfaction, strength, and love. This course has, in a short time, opened doors I didn’t know were closed and ignited a new way of looking at and thinking about my life, and my life purpose. The exercises and practices gently worked their magic on my inner processes and turned the way I look at my life completely around. Never has an online course been so satisfying. I am 60 years old. Join the wait list and we’ll notify you when enrollment opens again! Here is a fun video of Will Smith talking about Michaela and the Wild Woman's Way. Michaela was featured on Self.com: How 7 Super Successful Women Leaders Find The Time to Take Care of Their Health.